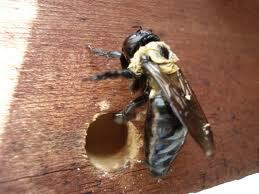 Every year I get calls to repair carpenter bee damage. 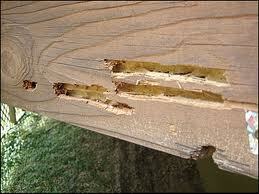 These bees don’t eat wood but instead bore tunnels in fascia boards, soffit and window and door jambs. They use these tunnels as chambers to raise their young and hibernate in the winter. A single bee can’t do much damage but the young come back every year and bore more tunnels and enlarge the existing ones. 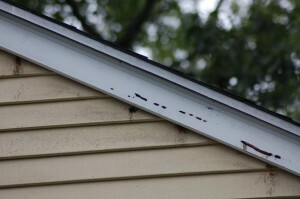 Over time extensive damage results if no preventative action is taken. Occasionally wood peckers will detect the bees in fascia boards or siding and riddle the surface of the boards to get at the bees and their larva. The best measure you can take to reduce bee damage to your home is to keep it well painted as bees prefer natural wood. Sometimes however they will bore holes anyway. If you see bees persistently hovering around your home they are probably drilling holes somewhere. 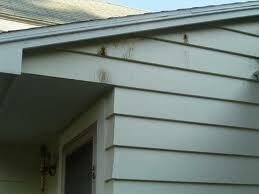 Look for smooth holes about ½ inch in diameter on the under side of your fascia boards or soffit. Other distinct signs of activity are small piles of “sawdust” directly under their holes and defecation stains on nearby boards. If you find holes in your home you should act promptly to limit the damage. Taking care not to get stung (the females have stingers) quickly insert a twig or ball of paper into the hole. Once the hole is plugged smooth over it with caulk or exterior wood putty and then paint the entire area. 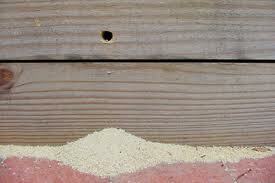 Repeat this process on all existing and subsequent holes to keep bee damage to a minimum. 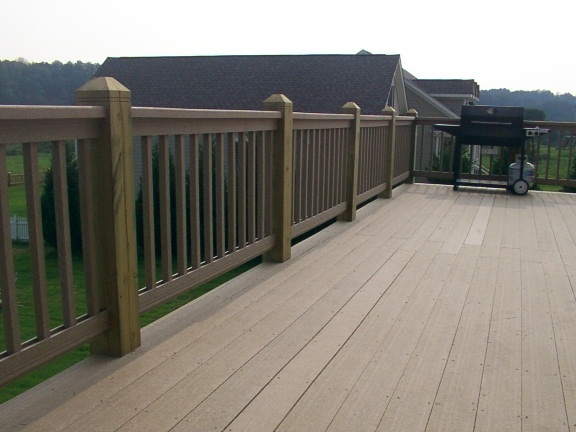 Remember Wood’s Home Maintenance Service has solutions to all of your maintenance, repair or building needs. This entry was posted in Exterior Maintenance, Siding, Windows & Doors and tagged bee damage, Bees, Brick molding, facia, facia boards, maintenance, painting, repairs, siding, windows. Bookmark the permalink.